This recipe is super easy and versatile. You can play around with different fillings and toppings to make it your own. But with that being said…. 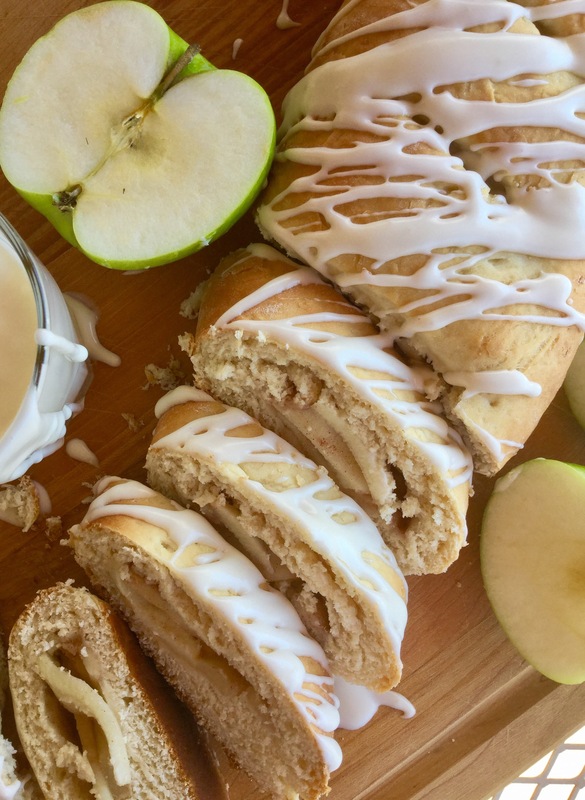 you have to try this pear & apple combination with the dried cranberries. Plus, the smell of this danish baking in the oven screams fall. 1)The dough must be made the day before you plan to serve. I make mine the night before and chill overnight. 2)This dough makes two loaves, you can make two different flavors; at the bottom of the post I have a apple pie version. 1/2 cup warm water, 110-118 degrees F.
Combine sour cream, sugar, butter, and salt in a medium-sized saucepan; heat until butter melts. Cool mixture to 110-118 degrees F.
Dissolve yeast in warm water in the bowl of a stand mixer; allow the yeast to bloom for about 5 minutes. Stir in the sour cream mixture and the eggs. Using the paddle attachment and with the mixer on low speed, gradually add in the flour. The dough will be sticky; over the mixing bowl tightly with plastic wrap and refrigerate overnight or for 8 hours. After the dough has chilled overnight, divide it in half and roll it out until it’s about 1/2 inch thick. In a medium mixing bowl combine all the filling ingredients together. Then evenly spread the filling over the top of the rolled out dough. Roll the sides of the dough up over the middle, then flip the whole loaf so that the seam is on the bottom. Cut about five slits on the top and place the dough in a warm place to rise for about 1 hour or until doubled in size. Preheat oven to 375 degrees F. Bake for about 20 minutes. While the bread is baking prepare the glaze: using a hand mixer beat all the glaze ingredients together in a mixing bowl until well blended. 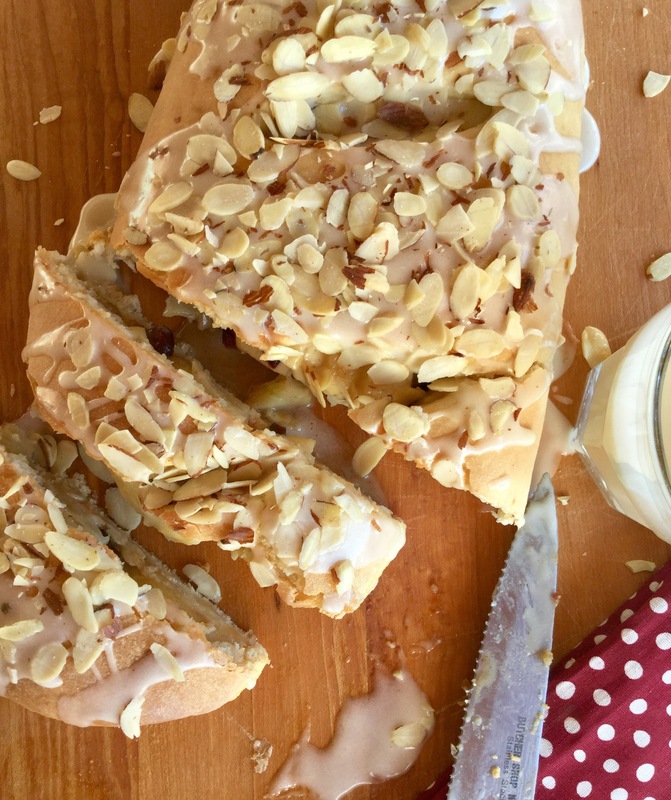 While the bread is still warm, generous drizzle the glaze and sprinkle on the sliced almond. Enjoy ! 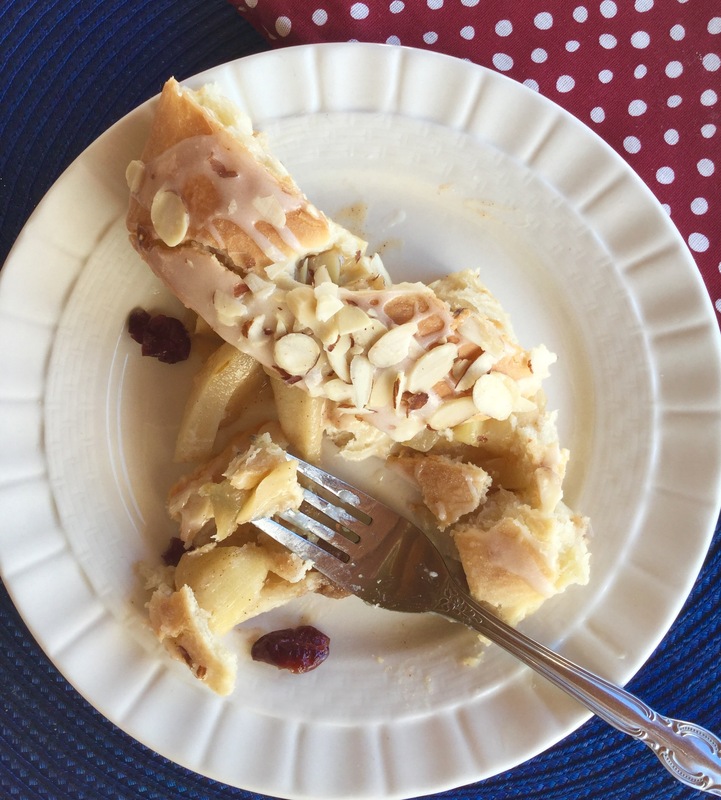 To make an apple pie version: omit the pears, cranberries, and sliced almonds.